Standardized lens bases were designed to span the range of dioptric powers that conforms to Oswalt’s equation (blue rectangles). Modern base curves have shifted downward, due to comestic preference for flatter lenses (red lines). Almost every ECP is familiar with the Tscherning Ellipse above, which indicates the two lens base curves that are optically ideal for each dioptric power. The top curve represents Wollaston’s 1804 calculation. The bottom curve represents the flatter, more practicable calculation introduced by F. Ostwalt in 1898, which became the basis for standardized lens base curves. Though modern base curve recommendations are slightly flatter due to cosmetic preference, Ostwalt’s calculation is still recognized as optically ideal. When the power of a lens is paired with its ideal base curve, the wearer enjoys clearer vision with minimal oblique astigmatism. When the base curve falls outside the ideal range for a given power, the wearer’s off-axis visual acuity diminishes precipitously. The further the base curve is from the calculated ideal, the more rapid the reduction of off-axis acuity. This has increased implications in a progressive lens, because the reading zone can only be accessed at an oblique angle. If the base curve is poorly matched, the patient may experience an abrupt drop-off in acuity in the reading area. Patients with high add prescriptions are even more likely to feel confined by this limitation. base curve. 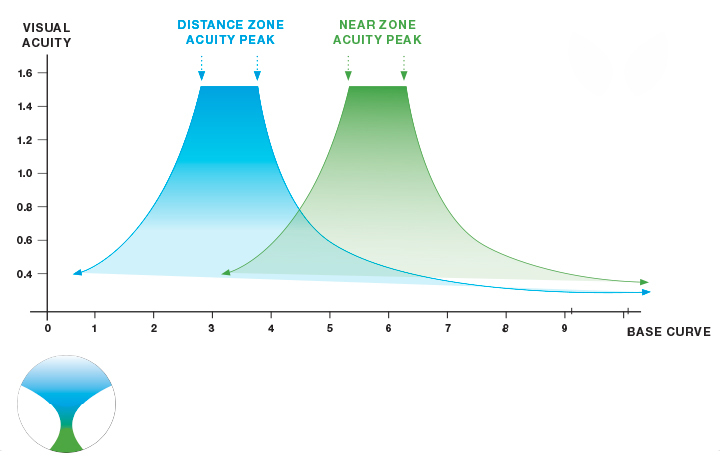 However, when a free-form progressive lens is processed from a single-vision lens blank, the various powers must share a single base curve, one that may not be ideal for the near zone. The Camber lens offers an elegant solution that represents the next step in digital progressive technology. Camber lens' front surface innovation offers wearers spacious, more comfortable fields of vision, in both the distance zone and reading area. 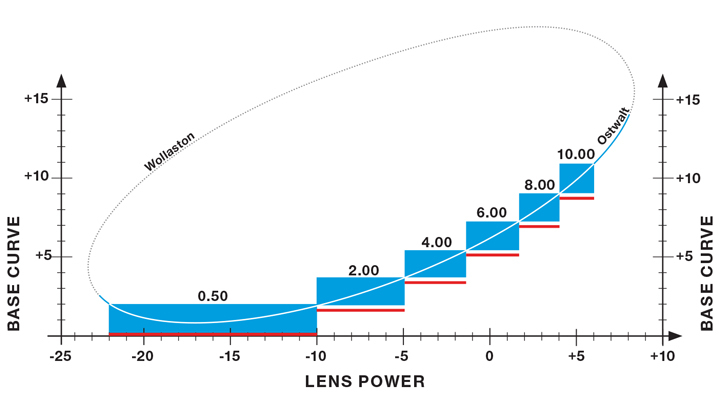 A progressive lens has many powers from distance to near, hence it has many ideal base curves, increasing in diopter from top to bottom.